​Excimer lasers, made by Coherent, are used by most small/medium OLED panel makers. The ability of excimer lasers to produce high-energy UV pulses is also benefiting other applications in displays and microelectronics manufacturing. Excimer lasers are used in mask-based direct patterning of microcircuits for cost-sensitive applications like medical disposables. The excimer laser is used to pattern a very high volume of disposable sensor circuits in thin metal on a flex substrate in a reel-to-reel process. Laser Lift-Off (LLO) is another important application required when a flexible substrate too thin to be processed in a standard fab is married to a glass substrate during the lithography and OLED deposition steps. The glass and the polyimide must be separated along a sacrificial layer. A high-power excimer laser beam, such as the specially designed UVblade series, is directed through the glass carrier (which is sufficiently transparent in the UV). The laser light is strongly absorbed by the sacrificial layer, which vaporizes and thus releases the completed flexible display from the carrier. Reports from the panel makers indicate that they are not yet satisfied with the yield and expect greater process control. etnews reports that Samsung Display changed from an excimer laser method to DPSS (Diode Pumping Solid-State) laser method for its next flexible OLED LLO (Laser Lift Off) equipment. Although AP System had been the sole supplier of the LLO equipment, Philoptics was added to a list of LLO suppliers and it quickly increased its market share. It is understood that Samsung Display filled its A3 line mostly with LLO equipment based on DPSS method. AP System is also developing DPSS LLO equipment. Samsung Display built its A3 line from the second half of 2016 until 2017, mostly with DPSS LLO equipment. The yield for the LLO process was low because the film cannot be damaged when it is being separated from a glass without any changes in properties. 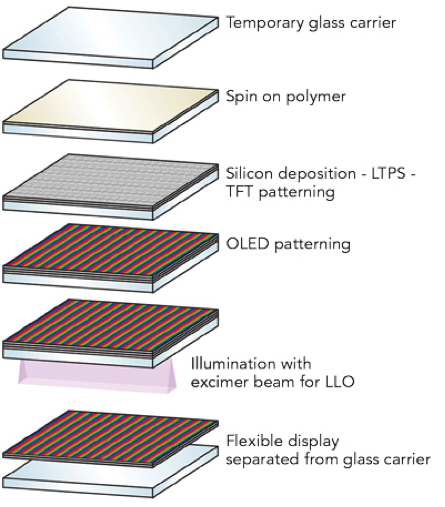 Samsung Display, which was the first ever to commercialize 6th generation flexible OLEDs, chose excimer lasers as the source for LLO equipment early on. AP System imported excimer laser source from Coherent (U.S.) and has supplied excimer laser LLO equipment to Samsung Electronics. This year however Samsung Electronics is focusing more on the DPSS method that is cheaper and is easier to maintain than the excimer method. The number of tools that is needed per line can be reduced and most of all, it is easy to maintain DPSS method. Philoptics imports DPSS laser source from TRUMPF (Germany) and it has reduced the time and cost for maintenance by forming its own optical system, which is needed to construct equipment, through its own technologies. Philoptics greatly improved its performance by delivering its DPSS LLO equipment to Samsung Display in 2016 and 2017. Philoptics’ equipment had a 70% share of LLO equipment purchased by Samsung Display in 2016. Philoptics is supplying all LLO equipment ordered by Samsung Display in 2017. Philoptics sales grew three fold from $54.3 million (60.7 billion KRW) in 2015 to $163 million (182.7 billion KRW) in 2016. Its ​operating profit went from -$7.33 million (8.2 billion KRW) to $14 million (15.6 billion KRW). Stock firms are estimating that Philoptics will make about $268 million (300 billion KRW) and $26.8 million (30 billion KRW) in sales and operating profit respectively this year. AP System changed its focus onto foreign businesses. It is supplying products mostly to Chinese panel manufacturers that are investing into 6th generation flexible OLED. Although it lost its position in LLO tools, its performance was not hugely affected as its dominance over ELA (Excimer Laser Annealing) equipment markets is still strong plus it added lamination equipment for back-end processes. Philoptics is also expecting that its domestic and foreign businesses will continue to grow. It is likely that Philoptics will participate in Samsung Display’s project when it decides to invest into its new A5 plant. It also started expanding its business in China and signed a supply contract worth $6 million with GVO this past September. Philoptics will construct a new building in Osan-si in order to expand and to prepare for its LLO equipment business. It decided to start the construction in February of 2018 and its goal is to move in to the new company building in December of 2018. “We are planning to combine our company, which is currently divided into four plants, into a new company building in Osan in order to secure medium and long-term manufacturing capabilities since growth of front-end industries and lineup of equipment have become very diverse.” said a representative for Philoptics.